After seeing a post on Under the Sycamore where Ashley Ann shared their new master bedroom, it got me thinking. Ashley mentioned that when her and her husband were engaged someone had told them to keep their bedroom about them... and with baby on the way I knew that would be a great idea for B and I as well. 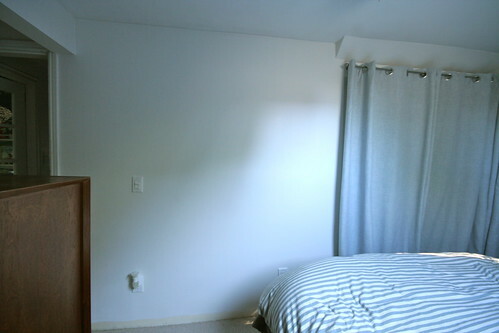 So, with that in mind, I wanted the artwork in our bedroom to be meaningful. I'm a big music fan, and an even bigger Bryan Adams fan (oh yeah!). So not only did a piece of artwork showcasing wonderful lyrics stick out to me, but Bryan Adams lyrics! Come on! Right up my alley! In the end, I knew I didn't want to copy this exact piece, and I also knew I would love to use a song that was special to both myself and B. Back when I was first considering this project, I was listening to some songs from Adele's album 21, and I heard her cover of the song "Love Song", and instantly knew this was the song. 311 also did this song and they are B's favorite band. The first time that we celebrated his birthday together, I bought two tickets for us to see them live in Toronto. I'm not the worlds biggest 311 fan, but I've been to 2 shows with him, and the lyrics to this song are perfectly us. So the day that we finally picked up our framed artwork from Michael's, I also picked up some essentials for creating a new, personalized master piece for our bedroom. What I grabbed was 2 canvas' for $14.00, 3 tubes of acrylic paint for $4.99 each, and some plastic letter stencils for $4.99. My total was just under $40 for everything. Once the canvas was dry, I got to work stenciling on my letters. 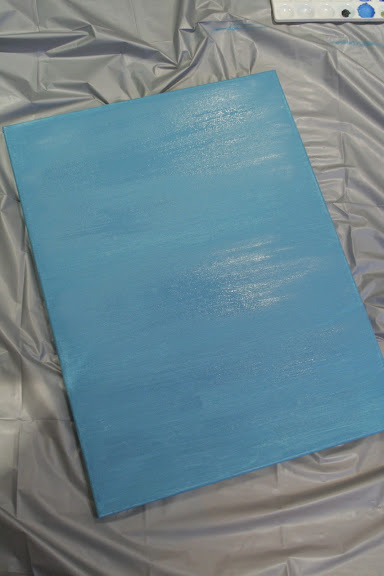 About one word into the lyrics, I realized there would not be enough space on one canvas to get anywhere near the whole song on. 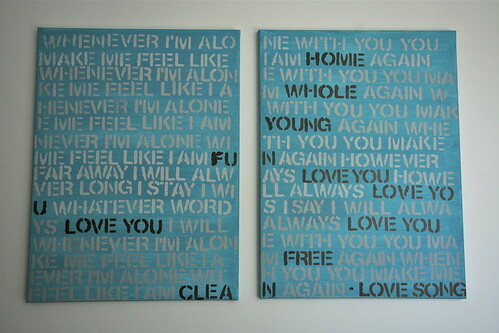 SO, B suggested painting the second canvas as well, and having the lyrics run across both. Genius! Lucky for me, the paint colour was super easy to mix again, and I got my second canvas coated pretty quickly. Have you created any custom and/or meaningful artwork for your home? kerry! i love that! the 2 canvases is a great call on b's part. i totally see this in my future, it's just a matter of where. and what song. love it! Kerry! This is beautiful! I have actually had that same photo in my inspiration files for a while too! 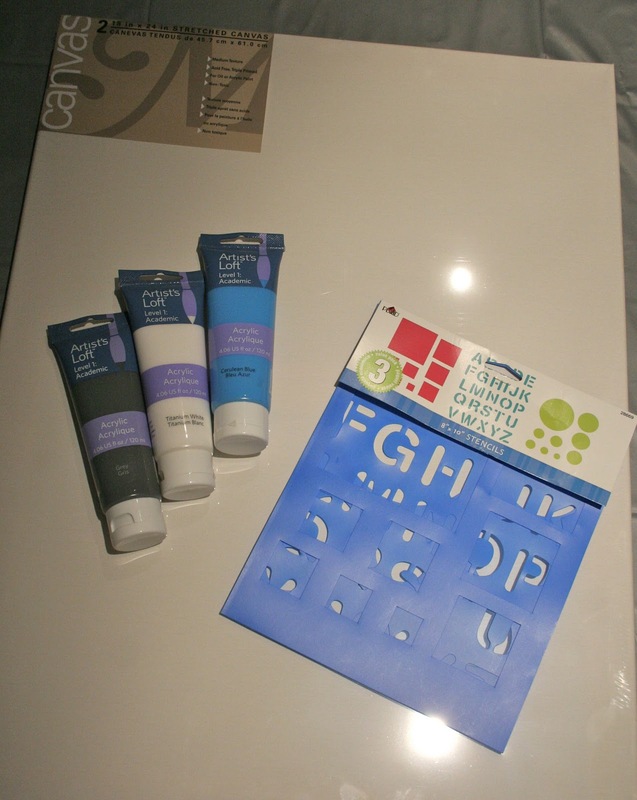 I even bought the stencils, but I haven't done it yet. I really love how yours turned out though and it's even better that it isn't perfect. P.S. The words in black are so sweet! What a great idea Kerry! So very fun and personal! Love this, girl! So creative and unique (: UM, any baby yet?! I love the variations in the blue background! What a great project. I painted a canvas and added a favourite quote for our master, as well. Makes it feel a bit more romantic, doesn't it? I love that project. My brother and sis-in-law have a similar project in their condo, but their canvas and letters are HUGE - I think they used lyrics from a Beetles song. They used a mini sponge roller and said that made stenciling on the letters a whole lot easier. oh! I missed this post yesterday! LOVE it. I have that same photo saved in my inspiration folder. I love how yours goes across the two canvasses - nice work! First of all, that looks great. I love it. I love that you used bright colour. Second of all, the original piece has been in my inspiration files for a long time too. So, for our anniversary in July, I also did a version of it for my husband! I'll post photos soon, it's in our master now. Third of all, where is that baby??? Your work is amazing, you are a very talented person and we are all so lucky to have you making beautiful things.